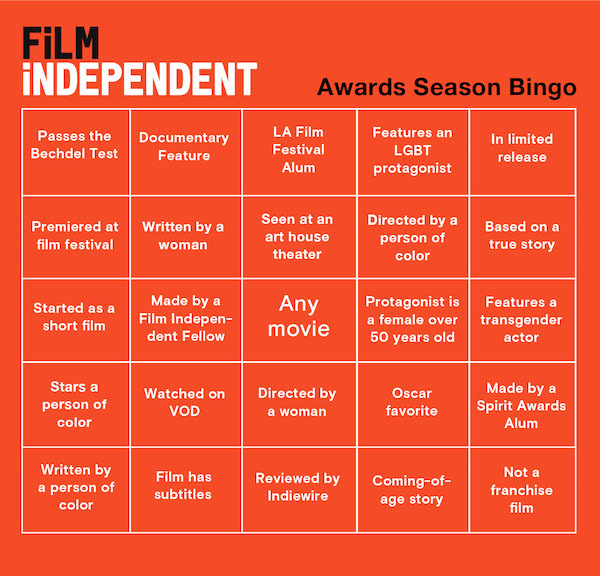 Play Film Independent’s Awards Season Bingo! Awards season is upon us. This weekend saw the release of awards hopefuls like Bridge of Spies, The Assassin and Room. Next weekend Steve Jobs and Suffragette hit theaters. As we move toward the Film Independent Spirit Awards and the Oscars, we’d like to challenge you to a little game of Awards Season Bingo. Here’s how it works: Print out the bingo card below, and as you head to the theater over the next few months (or stay at home on your couch), fill in the spaces with the movies you see. When you get five in row (vertical, horizontal and diagonal bingos all count), snap a picture and tweet us your bingo using #FilmBingo. We’ll retweet all completed bingos and draw three winners who will receive brand new Film Independent merchandise at the start of the new year. The real reward, of course, is the films. We spoke with Roya Rastegar, Director of Programming for the LA Film Festival about what her board might look like and she gave us a bingo’s worth of picks for the coming months. Straight Outta Compton is currently in theatres and is expected to be released on DVD and VOD in December. Beasts of No Nation was released in theaters and on Netflix on October 16. The 33 comes to theaters on November 13. Mustang, a co-production between France, Turkey, and Germany, is France’s submission for the Best Foreign Language Film Oscar, selected over Palme D’or winner Dheepan, which is also French production. Mustang will be released on November 20. Creed hits theaters on November 25. What’s on your Awards Season Bingo board? Tweet your bingos to @filmindependent and enjoy the films!